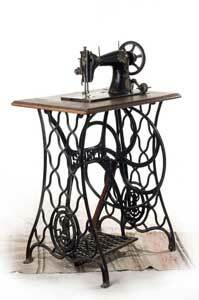 History shows that treadle sewing machines were a huge stepping stone for the industrial era. As for the present and future, this machine can give someone a chance to embrace the past and enjoy the simpler way of sewing. A non-electric sewing machine might be a hard concept to grasp, but this sewing machine proves to have its many professional and loyal users around the world. The user has much more control over the speed on this non-electric sewing machine and as soon as you stop pumping the treadle, the needle stops. As with electric sewing machines, you always get a few more stitches after you stopped due to the leftover energy in its wiring. Electricity is not necessary, as it is man-powered, which means it’s green. Relaxation is another benefit, as you get into the spin cycle a soothing rhythmic hum sets your mind at ease while you forget your worries and enjoy what you’re doing. The modern treadle machine is low maintenance and if taken care of properly will last forever. You never have to worry about wiring, computer chips or electrical malfunctions. Sewing and exercise, a two-in-one - You burn calories when you treadle and tone your leg muscle. This historical sewing machine does not have that many differences than the electric sewing machine; the primary difference between the two is the energy source. The treadle machine gets its source of energy from the user. It involves a lot of body coordination, which takes practice and patience. While this vintage sewing machine can be used for creative zigzag methods, the stitch itself is simple and straight. With this type of quality stitching and machine control, treadle sewing machines are best for quilting. It is suggested when first learning how to treadle to start by sewing a patch quilt block together. Using treadle sewing machines requires practice and coordination. Place the fabric under the needle and lower the presser foot. The best position for you to treadle would be to sit up straight and begin to use the ball of your left foot upon the upper left corner of the treadle and the heel of the right foot on the lower right corner. Then begin to pump your feet alternately. Use the same thread on the bobbin as on the head. Make sure the two strands are from the same spool, or else it will create unwanted tension. The machine does not have reverse, so you will need to turn the material around manually and stitch over the place you want to make stronger. Get the bobbin tension where you want it and within time and through practice begin to feel what adjustments are necessary for the upper thread. In order to keep your non-powered sewing machine in tip top shape rub it with 3 in 1 oil every month. Don’t forget to switch out the needle every time you finish a project and use high quality thread. Sewing machine experts suggest that when you are in the process of purchasing a treadle machine it is best to go with the original, Singer treadle sewing machine. Since these models are antiques, it will be easier to replace and buy parts for a Singer sewing machine because they have numerous treadle machines available. If you would prefer a more modern treadle model that better allows you to sew more intricate stitching, consider the Janome treadle sewing machine. Treadle experts always insist that if you see treadle sewing machines at auctions or garage sales, pick it up because that is a true antique steal.